The tendency of filling up reservoirs in the beginning and middle of monsoon season have been leading to avoidable flood disasters in the country. Apart from Kerala flood 2018, which was aggravated by mismanagement of reservoirs, various reports show that reservoirs in river basin of Cauvery, Krishna, Godavari and Ganga were also filled up well before the end of South West monsoon season. Resultantly there were many man made flood spells in downstream areas affecting lives and livelihoods of people. After highlighting role of dams in floods in Kerala and how improper dam operation affected people in Assam and Himachal Pradesh, this third and concluding part throws light on other dam induced flood (and canal breach) incidents in 2018. In the middle of July, there was serious flood risk in Cauvery river basin as all four major dams in Karnataka – Krishna Raja Sagar (KRS), Kabini, Harangi and Hemavathi – were full. As a result, Karnataka started releasing water from these dams, raising flood threats in downstream areas and in Tamil Nadu. Flood Hydrograph at Kodamudi in Erode Dist in Tamil Nadu showing sudden steep rise in water level past Warning and Danger level in last 24 hours. The shows the trend line for last 72 hours ending around noon on July 24, 2018. Following the release of water gushing from Karnataka reservoirs to Tamil Nadu, Salem district collector issued flood warning in the second week of July. There was possibility of flood water from Hogenakkal, entering Cauvery river. Flood warning was also issued for areas around KRS Reservoir on Cauvery in Karnataka. In Tamil Nadu the Bhavani Sagar dam was getting filled in June 2018 and there was a flood alert even then. Again in July 2018 a flood alert was issued for people living along Bhawani river as the dam level touched 80 ft against the full capacity of 110 ft. The Siruvani dam also overflowed after 5 years as its water level increased 40 ft from 15 ft in just 4 days. The Mettur dam also achieved its full reservoir level (FRL) of 120 ft in the third week of July 2018. This was the 39th time that the Mettur Dam achieved FRL in its 85-year-old history. The last time the dam became full was in the first week of August 2013. First for lack of water and then by flooding of the Mettur dam also significantly affected the livelihood of more than 2000 fishermen community. The dam continued to overflow for the three days meanwhile KRS also started releasing over 80 000 cusecs of water in the third week of July 2018. Amid all this, India’s premier flood forecasting agency, CWC, seemed to be in slumber by all indications. The state govt instead of remaining alert seemed celebrating the incidents of dams getting filled up in month of July itself. In past, both Tamil Nadu and Karnataka have shown poor performance in managing dams to avoid floods. The recent CAG report has clearly said that the wrong operation of dams in Chennai led to avoidable floods. Again on Aug. 12, 2018, the discharge from Mettur Dam into River Cauvery stepped up to 1.13 lakh cusecs flooding over 50 houses in Bhavani and Kodumudi and forcing eviction of residents. The situation remained critical in Palakarai in Bhavani where flood water entered many houses located along the banks of the river. A flood alert was in place in 12 Tamil Nadu districts as the Cauvery river overflowed with excess water being released into it from the brimming Mettur dam and submerged houses in Namakkal district. With release of over 50,500 cusec from the Bavanisagar dam to the Bhavani river on Aug. 15, the river flooded for the first time in 17 years. On Aug. 16, more than 200 people were evacuated from Thavittupalayam village near Thirumukkudal in Karur as floods inundated their houses and hundreds of acres of agriculture land. The area was at the confluence of three rivers Cauvery, Bhavani and Amaravathi rivers. It was after more than 40 years that over 3 lakh cusecs flow was seen at the location. With Kerala and Karnataka releasing 2.1 lakh cusec from the Kabini and Krishnaraja Sagar dams into Cauvery, the level of Mettur dam was expected to rise further. Following the release, the floodwaters submerged vast tracts of coconut groves, and plantain, turmeric, tapioca and groundnut farms in Namakkal. Among the worst affected by the flooding of the Cauvery were the largely impoverished daily wage labourers who have built homes on the river’s banks in Pallipalayam and Kumarapalayam, and in Bhavani, Karungal and Kodumudi in Erode. At Mayanur, a disaster management team tried to arrest the erosion of the bank on Aug. 19. The base of the building housing the PWD’s control room was getting washed away. On Aug. 11, the Mettur dam attained full capacity of 120 feet for the second time in 2018 after 5 years and there was heavy discharge into the Kollidam from Mukkumbu (Upper Anaicut). The old Kollidam steel bridge built across the flood carrier Kollidam, connecting Srirangam, famous of its temple, with the mainland, developed a major crack in the 18th pier on Aug 15. Owing to the continuous inflow of water, the crack in the 18th pier widened. This had also weakened the 19th pier, leading to the collapse. On Aug. 22, eight of the 45 shutters of Mukkombu dam (Upper Anaicut) along with the piers washed away after sudden increase of water in Kollidam river. Following this, hundreds of villages in the area faced a threat of flood. Political parties blamed the govt. for negligence, indifferent attitude towards the maintenance of dams and illegal sand mining leading to the collapse. Around July 19, Karnataka suddenly released huge quantity of water from Tungabhadra dam submerging world heritage sites at Hampi downstream. It was surprising that Karnataka did not start releasing water earlier and waited for the dams to get full even before middle of July. Similarly, at Shimoga in Karnataka on Tunga River in Krishna basin, due to water release from Tunga dam the previous HFL: 568.28 m (15.7.1994) was crossed at just after 1100 hours on Aug 14, 2018, reached upto 568.45 m, and came back to HFL by 1500 hrs on the same day. Moreover, at Holehonnur site on Bhadra river in Krishna basin in Chickmagaluru district in Karnataka just downstream from Bhadra dam, the previous HFL of 561.04 m (6.8.2004) was crossed just after 1100 hrs on Aug 14, 2018. Reached 563.6 m at 2300 hours on Aug 15, 2018 and remained above HFL at least till 1200 hrs on Aug 17, 2018. This flood that travelled to Tungabhadra and Srisailam. Around Aug. 17, the Srisailam, Almatti, Tungabhadra, Jurala and Koyana dams in Krishna Basin were full. Around same time, minor projects in Godavari basin were full. On Aug. 17, the Penganga river threatened to breach its banks following release of about 4 lakh cusecs water from dams upstream in Maharashtra. This also showed that dams in Krishna and Godavari basin were being filled before the end of monsoon which could have created flood disaster. 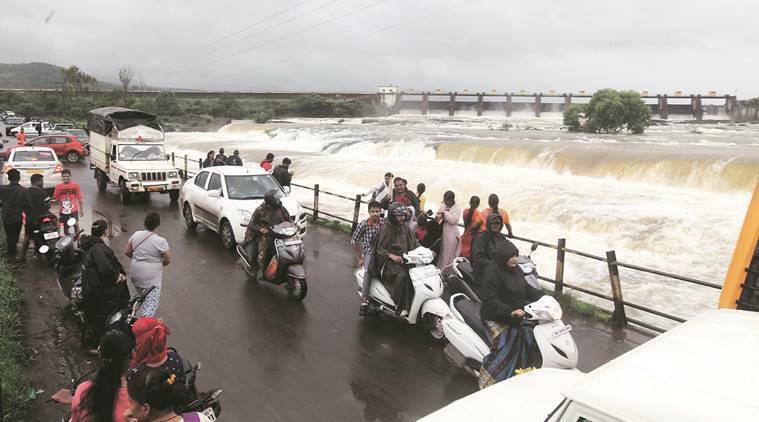 Low-lying areas of Pune were put on alert after the irrigation department released water into Mutha river at the rate of 18,491 cusecs on July 16, 2018. This suggested that the dam was already full within a month of the monsoon in violation of rule curve. Similarly, the Khadakwasla dam reached its optimum storage capacity on July 16, a week before its usual time. In the same month, Radhanagari Dam on Bhigavati river was filled and started releasing water to the downstream from its gates around July 20. The dam was filled up about a month before the normal date. In the last week of July 2018, as many as 8 dams in Bhima basin discharged water into various rivers following significant surge in the water levels during a week. Mutha Canal Breach Nearly 350 low-income and slum tenements of Janata Vasahat were flooded with water on Sept. 25 after the Mutha right bank canal wall suffered a breach causing minor floods in the Dandekar bridge area. At several places, weak constructions and walls had collapsed and the residents tried to collect their valuables from the debris. Water was flowing at the rate of over 1400 cusecs at the time of the incident, but the irrigation department immediately stopped further release of water in the canal from the Khadakwasla dam. Sudden flow of water into homes and busy roads in the area led to chaos and panic among residents and motorists. Irrigation department officials said they were ascertaining the causes of the breach and also taking remedial measures. 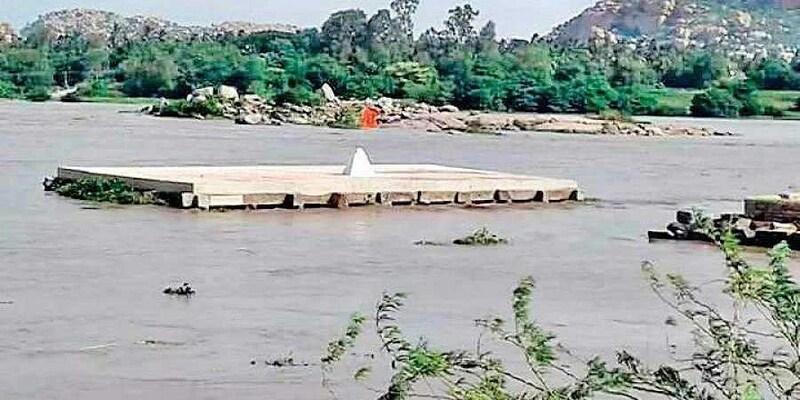 On Sept. 3, the gates of Rajghat and Matatila dams were opened causing flash flood in river Betwa affecting about 50 villages along the course downstream. As per reports about 5 lakh cusecs water was released from the dams. The sudden rise in water level also trapped the villager in river islands at two locations. At Sukuwan-Dunkuwan (Kandhari Kalan) Lalitpur about 6 herders were trapped on an island and at Jhujhanpura village under Garotha tehsil, Jhasi 8 fishermen had to run to an island to save their lives from the sudden deluge in the river. The 8 villagers had gone for fishing in Betwa release but got stranded in flash floods. The sudden increase in Ganga water level in Bijnour damaged the vegetables crops of floodplain farmers on June 10, 2018. In another incident, a minor in the area breached and flooded hundreds of acres of cropland. The embankments downstream Kodiram and Maloli embankments on Ami and Rapti rivers were in dilapidated condition and left unrepaired raising flood threats in many villages in Gorakhpur district. As per report, the embankments had breached in 1998 and 2001 causing disaster for local people. On the other hand, the release of 92000 cusecs water from Banbasa barrage into Sharda river on July 28 led to flood situation in Lakhimpur Kheri district. Flood threat loomed large over Patna district on Sept.8, after the Madhya Pradesh govt released 3.55 lakh cusecs of water from Bansagar dam into Sone river. As per information, the Madhya Pradesh govt was supposed to release 5.25 lakh to 7.0 lakh cusecs of water from Bansagar into Sone river on 7 Sept. MP govt website showed that Bansagar Dam in Sone river basin was full, violating the rule curve and was about to create yet another flood disaster in Bihar. Ganga water was rising following flood spell in Chambal, Ken and Betwa river and the release of Bansagar dam in Son river further aggravated the situation. Fortunately, since rainfall suddenly and totally stopped in the Bansagar Dam catchment area, averting a possible disaster. Bihar’s Chhapra was flooded due to overflowing of Sarayu River. Water entered houses and locals faced difficulty in carrying out daily activities. A diversion on Madhya Nadi on Chhapra Hazipur National Highway-19 was washed away blocking traffic movement. At this time the Ghagra and Kosi river were also in flood. The massive silt brought by Ganga is mostly trapped upstream of Farakka, the quantum so trapped is matter of speculation and debate as CWC has no information or credible assessment about it. That silt, accumulating since the commissioning of Farakka barrage in 1975 is making the discharge of water from upstream of Farakka sluggish, and thus creating prolonged flooding on both sides of the Ganga, as also its tributaries in some cases. It is feared that this sluggish flood discharge behaviour of Ganga may make the flood situation in Bihar along the Ganga severe and prolonged from Aug first week. True to apprehension expressed in SANDRP blog on Aug 3, the Farakka water level remained above warning and danger level till close to end of monsoon, creating drainage congestion and flooding in Ganga throughout its passge through Bihar. Is Farakka Fuelling Erosion Downstream? Several areas of Nadia and Malda districts experienced severe erosion of riverbanks over the first two weeks of Aug 2018, coinciding with the weeks when Farakka water level crossed danger level, rendering hundreds of people homeless. Among the severely affected villages, three are in Nadia district while one is in Malda district. The area residents claim that they go through this ordeal almost every monsoon. The situation generated severe discontent among the locals against the district administration and the Farakka Barrage Project authorities. Locals alleged that the project authorities “ignored” their warnings regarding the erosion. On Sept. 26, the members of 96 Pani Panchayats under Upper Kolab irrigation project demanded an immediate inquiry into the sudden release of water from the Kolab dam which caused floods in Malkangiri and Koraput districts a few days earlier. The Upper Kolab authorities had opened two sluice gates on Sept. 22, when the water level was about 857 metres while its Full Reservoir Level is 858 metres. Apprehending more inflow of water from the catchment areas, the project officials had opened the gates for a day. As a result, low-lying areas were inundated. The Malsisar dam in Jhunjhunu breached on March 31, 2018 inundating several areas. Though there was no loss of lives in the incident, a large number of cattle and vehicles were swept away in the torrent. The tehsil bhawan, police station and other official buildings are surrounded by water. The pumping station and other buildings associated with the project too have suffered damage. Launched in August 2013, the project had set the target to supply water to 1,473 villages and Malsisar, Khetri, Jhunjhunu and Sikar towns. The lift irrigation project, bringing the Himalayan waters through Indira Gandhi Canal, was completed at a cost of ₹588 crore and had started supplying drinking water in its first phase. The dam was constructed by Nagarjun Construction Company. Amid charges of corruption and questions over the construction quality, the state government set up a high-level committee to investigate the incident. Later the State government registered a first information report, besides imposing a penalty of ₹2.75 crore, against a construction firm which had built the dam. 2 executive engineers of the Public Health Engineering Department, looking after the water supply works in the State, were placed under suspension and a three-member committee was appointed to probe into the incident. As per another report there are two dams built in Malsisar one has leakages and the other has breached. The report also reveals that the dam has dried up now. In Sept. 2018, the Panchna dam on Gambheer river in Karauli district touched the danger mark of 257.20 m. Following the situation, Karauli water resources department opened 5 gates around 4 am on Sept. 6 morning, releasing around 8,000 cubic feet of water per second, to reduce the level of water in the dam. As result, all villages in Bharatpur, falling under sub-division Bayana and Rupwas, were put on high alert. On Sept.23, the Bandhakhedi dam at Rajasthan Border breached flooding Shivna town of Mandsour, MP. 9 houses in Rampur Seuri labour colony at Surajpur near Amravati enclave were washed away after Haryana Irrigation department opened floodgates of Kaushalya Dam on Sept. 25, evening. 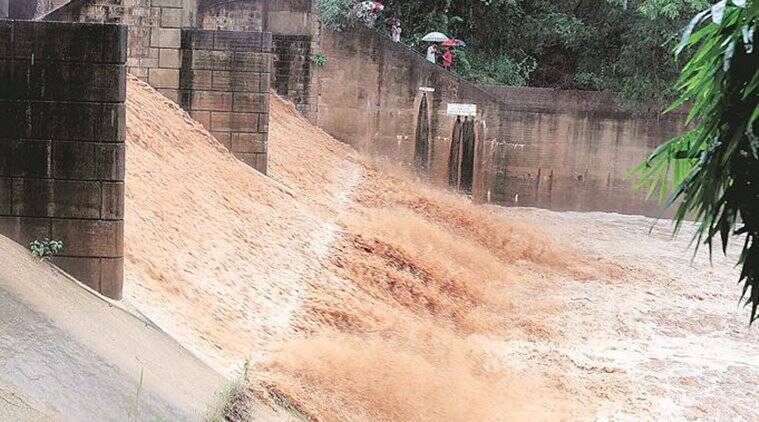 Heavy rain on Sept. 23-24 led to an increase in the water level of the Kaushalya Dam which had crossed the danger mark of 478 metres. Fearing a flood situation, officials of irrigation department moved to open 3 out of 6 floodgates. On Sept. 3, a breach in Western Yamuna Canal in Karnal inundated hundreds of acre of cropland. Villagers had to spend the night on the roof of their houses. Several families suffered huge losses. Three Houses collapsed and residents demanded compensation. Affected farmers held sand mining in canal responsible for the incident. Then in last week of Sept., the overflowing Yamuna river entered several villages at Indri block of Karnal district submerging thousands of acres of standing crop after release of water from Hathini Kund Barrage, Yamuna Nagar. Farmers alleged that the govt did not take required steps to control floods from Yamuna as they have faced the flood second time in the past two months. On Aug. 24, the Mansarovar dam in Neemach districted breached flooding several villages in the area. The water current swept away 50 feet stretch of a road disconnecting 40 villages from district headquarters. 11 people out on a picnic at Sultanpur waterfall in Shivpuri district died after they were swept away by sudden strong currents on August 15, 2018. 45 others who were trapped at several locations at the rocky base of the waterfall were rescued. It seemed that flash flood was created by upstream dams however there is no information about this. On Nov. 2, water released in Kaliyasot dam canal choked with solid waste, flooded residential areas, roads in Bhopal. 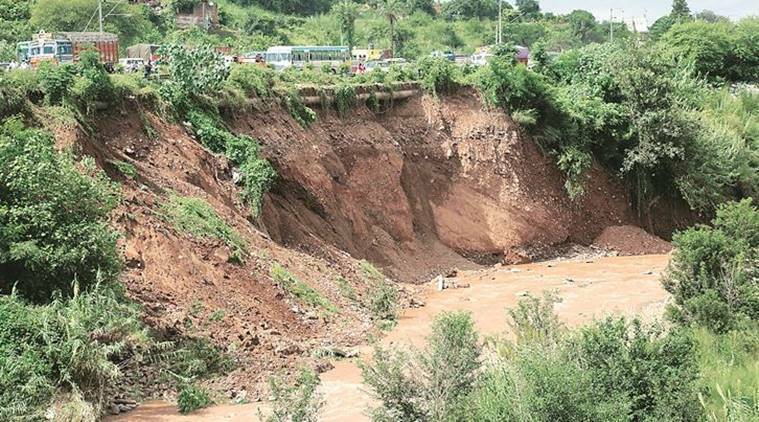 A side wall of the main Bhakra canal caved-in near Century Enclave police post on the Nabha road leaving a 15-foot-wide gap in the late hours of June 29. Fortunately, the cave-in did not lead to the canal breach. However, experts believed that possibility of the breach could not be ruled out following heavy rains in the next few days. Farmers of the nearby villages were worried because breach could destroy their paddy fields. 30 people from Van Gurjar community were trapped on an island by flood waters of Yamuna at Dhalipur Dehradun on Sept. 26, 2018 after water was released from Dakpathar barrage, Vikas Nagar. They were rescued by the Jal Police. A bund to divert river waters into the diversion tunnel of the 48 MW hydel project at Lower Kalnai, a tributary of Chenab river in Doda district, was washed away on June 30 morning. The bund was also damaged in 2017. As per officials, apart from the bund, several equipment, including earthmovers were washed away and the project site was damaged significantly. The floodgates of Sukhna lake were opened on Sept. 25, after the water level in the lake crossed the danger mark of 1163 feet. The last time the floodgates were opened in a similar situation was a decade ago, in August 2008. The released water crossed Kishangarh, Industrial Area and Makhanmajra before joining the Ghaggar. Machchhu, Act of God, one of the most awaited Gujarati film’s poster was released in June 2018 and got rave reviews from the industry. The film directed by Shailesh Leuva revolved around the devastating flood and the burst of Machchhu dam in year 1979. This was possibly the first Indian film on dam disaster.